Title: Ara Artist: Runaleiks Origin: Spain Band formed in 2015, the lyrics are in gothic, the band's quality is nice! GET ALL TRACKS: https://runaleiks.bandcamp.com/ Lyrics: Jah afhaimeis ara for airis miþþanei himinis siuns was aiweina jah nahts was kalda wilþja jah sunjeina, bandwo himinis waldands, þus hunsl gibôs und andi dagē aftra uswakjands Jah windos gasokun laista þeinamma Huljandans miþ stubjau hlaiwa, lausos heþjons Urraisida aljakundamma guda , ganaglida Gagg nu, þu ara, ufaro fairgunjam, hindar milhmam und andi dagē aftra uswakjands Jah afhaimeis ara for airis miþþanei himinis siuns was aiweina Airzeins, dishulidos airzeins Fram laggai hweilai, izwaros airzeins saihwa In meinana wratodu ara jah guma swe aina waihts wesum, allwaldandei Hansos , blindáizē hansos broþrjus wiþra broþruns, gamainidêduþ namo mein þata nu ist gawaírþi þeinata, bleiþei þeina bi galgins namin gatimridêduþ liugn aþþan Ik witja, gafulginin ansau Bloþ, runs bloþis ara jah guma swe aina waihts sijum, und andi dage jah ara kann Translate: And the eagle traveled, long time ago when the sky was eternal and the night was cold. Wild and true, the sign. Governor of heaven, we offer to you the sacrifice, until the end of days. Awakening again. And the winds silenced your trail, covering with dust the graves, empty rooms. Raised for a foreign God, the nailed. Go Eagle now, beyond the mountains, beyond the clouds. Until the end of days, awakening again. And the eagle traveled, long time ago when the sky was eternal… Errors, secluded errors. Since a long time, I see your errors. During my trip, eagle and man were as one, omnipotent. Batallions, blind battalions. Brothers against brothers, you’ve made dirty my name. This and no other is your peace, your mercy. In the name of the Cross, you’ve built the lie. But I watch over, hidden As. Blood, blood running, Eagle and Man were as one, ‘till the end of days… And the Eagle knows. 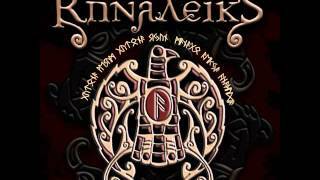 All music and lyrics are by Runaleiks, all rights reserved.